Video Source: Youtube; reproduced here. Sextortionist Blackmailer of the Year, starts 11:42: "This next award is for the rapists of the Internet." Kody1206 is nominated at 14:06. Video Source: Youtube. Addendum: Toronto man fired after trolling Todd Facebook page, 16 October 2012. Addendum: Mother of man (falsely) identified by cyber-vigilantes lashes out at online lynch mob, 16 October 2012. 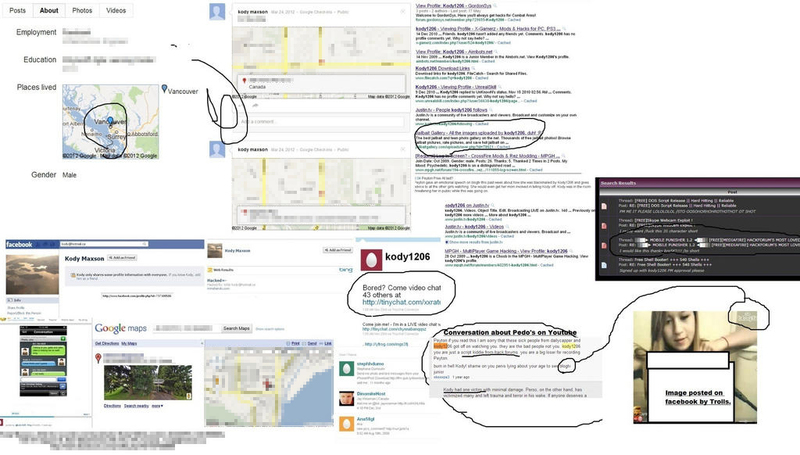 Addendum: Police distracted by false information circulating online around Todd case, 16 October 2012. VANCOUVER -- Rumours circulating around a man accused of being involved in Amanda Todd’s suicide have Mounties and police dedicating officers to dispel online gossip. A New Westminster address and a man’s name were released, shortly after Todd’s death last Wednesday, by a group claiming to be Internet activist collective Anonymous. Todd, 15, killed herself after enduring years of bullying and being stalked by an unnamed online predator who friends say used different online aliases. In a statement Tuesday, RCMP Sgt. Peter Thiessen said the allegation against the man was “unfounded” and no autopsy photos were ever leaked. Additionally, some have put up fake fundraising pages, presumably to "profit” from Todd’s death. “We want to urge everyone who has been touched by Amanda’s story to respect Amanda’s memory by being a responsible citizen of the Internet,” Thiessen said. The case has gathered so much online attention that on Tuesday, New Westminster police had a patrol car camped outside the address that was published by Anonymous. “The people that live there have nothing to do with the Amanda Todd case at all,” said New West Sgt. Diana McDaniel, adding there are no police records of the named man living in the city. A man with a similar name as the one published by Anonymous appeared in Surrey Provincial Court Tuesday on a charge each of sexual assault and sexual interference of a person under 16. But there are several differences, such as a different age and name spelling. The man named by Anonymous is 32-years-old, while the man in court is 19. The former appears to use a shortened version of the latter’s name, though both share the same last name. According to CTV, the 19-year-old knew Todd, but had already talked to police. RCMP investigated that file before the courts in early September. Crown spokesman Neil MacKenzie said the allegations are dated between Aug. 1 and Sept. 1 and are unrelated to Todd in any way. Twitter account Anonymous New Jersey claimed responsibility for naming the man and tweeted on Tuesday, they were “off” on the man’s address and name. “Everything I got is circumstantial,” the group tweeted later. B.C. Premier Christy Clark, speaking in Nanaimo Tuesday, said the public needs to stop reposting false information and look at everything online with a critical eye. Addendum: Hacker News reports that there is another suspect in the case, 19 October 2012. I don't get these Capper Awards. Why are they called Capper Awards? What do a collection of self-congratulating creeps and criminals have to do with screencapping movies and TV shows? They should leave the real capper community and call them Creeper Awards. And then turn themselves into the police. Capper Awards - I don't know, Paul, seems a weird extension of the definition of capper. But then again, the goal posts on the Web are always moving. Of course, I don't know who these people are. All the awards seem to be for creepy underground chatroom stuff, involving the exchange of personal photos and videos. Since the RCMP has denied that the person identified by Anonymous is connected to the Todd case (I don't know how they know that), I wonder if these so-called Capper Awards are at all relevant.